● William Shakespeare, sometimes affectionately known as The Bard, was born in 1564 in Stratford-upon-Avon, England, probably on St Georges Day, 23rd April. ● It was during these years in the capital that he penned some of the greatest literary masterpieces of the English language. ● His prolific literary output included around 154 sonnets and 38 plays, many of which continue to be performed and admired all over the world to the present day. ● He retired back to Stratford-upon-Avon around 1613 and died there just three years later at the age of 52. 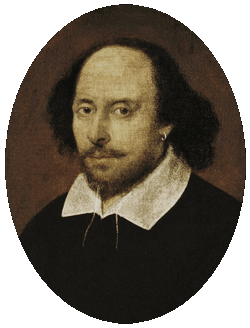 ● Shakespeare and his works have become the subject of numerous conspiracy theories over the years, questioning whether he really was responsible for writing the works attributed to him. This is largely due to there being no evidence of his having undertaken any level of higher education, which the author of the plays clearly must have possessed. Favoured candidates for an alternative authorship include the Earl of Oxford and playwrite Christopher Marlowe, but no conclusive proof has ever become available. Also, it should always be remembered, absence of evidence is not necessarily evidence of absence. Sonnet 18 - Shall I compare thee to a sumer's day?